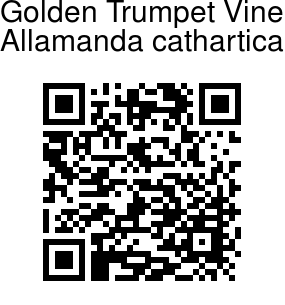 A tropical twining vine, native to Brazil, with deeply veined, whorled leaves and large, trumpet shaped bright yellow flowers. Prickly seed pods follow the flowers with winged seeds that fly about when the pod dries and breaks open. 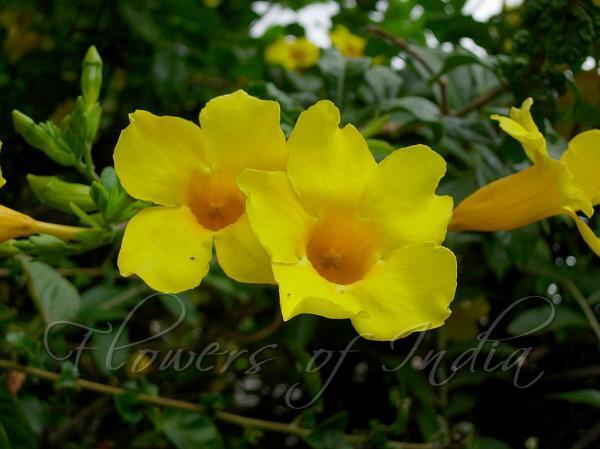 The Allamanda vine is a fast growing rampant vine that always looks better with training and pruning. It flowers almost all year. The plant has milky sap and is considered poisonous; all parts are highly cathartic (hence the botanical name) Texture is coarse and leaves are bright to light green; the plant is often pruned and used as a shrub. Photographed in Nasik, Goa & Bangalore.